As we begin the new year, most churches are entering Annual Meeting season. Budgets will be proposed and approved. Reports on how the past year’s ministry has gone will be presented. Plans for the year will be laid out. For a lot of church people, annual meetings are a necessary evil. Boring meetings about boring things. But annual meetings have a significant effect on ministry. If you really want to know what a congregation values, look at the budget. If you want to know what a denomination focuses on, look at the budget. Churches might put things like “All are Welcome” on signs, but have nothing in the budget for hospitality ministry. Churches might have mission statements about growing in faith or serving the poor, but have no budget lines for educational resources or funds directed to outreach. While what churches have failed to budget for or invest in is interesting, what they do put their time, energy and money towards is even more interesting. And so often churches invest in things that simply make no sense and make one wonder what is actually trying to be accomplished. In fact, churches often invest in or put their resources into ventures that have little chance of yielding fruit. Lutherans in Canada have been primarily rural during our history. Most of our congregations are in rural communities. This made sense as it has been only in the past decade or so that the shift in Canadian society has been from a majority rural to majority urban population. Generally urban congregations tend to be larger with more resources. Rural congregations tend to be smaller with fewer resources. So seeing struggling rural congregations, church leadership tends to invest in places where the church is struggling. Our seminary has developed an entire institute devoted to rural ministry offering a Doctor of Ministry degree in rural ministry. Multi-point and regional parish ministry is being explored and developed to help a few pastors serve many congregations in a team setting. Rural congregations are often given travel subsidies for church events. Skype and other video conferencing technology is being used to include rural folk. This is all good and rural congregations deserve good ministry. Yet, all our efforts are fighting against the demographic realities of shrinking rural communities. There are fewer and fewer people to minister to in rural contexts. We are putting disproportionate resources towards smaller groups of people. At the same time, because urban congregations are perceived as large and self-sufficient, we leave them be. Yet, they are shrinking too and it is not related to demographics. In fact, there are more people than ever who have no church affiliation living down the street, within blocks, driving by urban churches every day. Shrinking urban churches are the result of changing culture, mission-drift, a lack of evangelism and failed education systems in churches. Yet, there is little energy, time, resources or even concern going into helping urban churches understand the people that live next door to them. Churches will bend over backwards to keep nearly comatose Sunday School programs alive. They will long for the youth to come and “get involved.” They want young adults to “come back” to church in order to get take up the jobs that older people want to give up. Precious volunteer energy and resources are spent on doomed to disappoint ministries. Yet, the things that they are asking of kids (to attend regular faith education programs) and youth (to fill most leadership roles in worship), adults are mostly unwilling to do themselves. They expect young people to want to do things that older people want to stop doing… it makes no sense. But perhaps more importantly, we have hit another demographic tipping point where there are more over 50-year-olds in Canada than under 50-year-olds. That means at best, a church can hope for 1 family of 4 for every 2 empty nest couples in church. If you have 30 couples over 50 in church, you will only have about 15 families. Of course it will seem like the young people aren’t around… but that is because they don’t exist. Churches long for young adults and young families thinking that they will have the time, energy and money to keep congregations going. Yet increasingly, young adults and young families are under-employed, highly indebted people with precious discretionary time on their hands and who are trying to make it through a high cost time of their lives. Yet the Baby Boomers, the richest generation in history, are reaching the end of their careers. The largest group of retired people ever is about to have loads of time and money on their hands. Why don’t we have Sunday School for them? Retiree workers instead of youth workers? Why don’t we want 65-year-olds putting on an alb and lighting the candles in worship? Many churches spend a lot of angst on young people, who (demographically speaking) don’t even exist. But the people who do exist, a glut of boomers, are largely ignored. Why do congregations, church bodies and leaders so often see their hope and future in unrealistic visions of church? Why do we invest in ministries and activities that have little chance of yielding fruit for us? I don’t know if there is one answer. I think it has to do with fear of disappointing those led us into faith in the first place by doing things differently than they did. It has to do with longing for a return to the glory days of the past. It has to do with a fear of change, and our world is full of change these days. Now, I wish this was the part of the blog post where I explained the magic bullet to turning this poor investment strategy, this poor ministry culture around. But I don’t know the answer. Well, let me rephrase. I do know the answer… and so do you. But the answer is hard work. Churches need to look around ask what faithful ministry looks like in their context. Find out who our neighbours are. Find out what the needs of our communities are. Ask what opportunities is God putting before us. Discern who God is calling us to serve. Be willing to let go our expectations and vision for ourselves, and ask who God is calling us to be. Strive to be faithful in our investments and ministry planning rather than successful. This Annual Meeting season instead of seeing long boring meetings about boring reports and boring talks, consider it an opportunity to discover where God is leading our congregations and communities. Who knew Annual Meetings could be that? Millennials grew up differently. Our experience was tremendously focused on the group. Our education was often focused on group work, we were taught to consider others, to share, to be respectful, to work as a team. We are also the social media generation. We often define ourselves by the communities we keep. So with all this in mind, let’s turn to Netflix, who made all 10 seasons of Friends available to watch recently. It only took Courtenay and I a few weeks to binge through all the episodes. Friends became a kind of houseguest, hanging out in the background as we cooked, read, interneted, played with our son, or snuggled up for the evening on the couch. Friends was a culture defining show during its run. The quirky group of six young adults in New York, getting their footing career and relationship-wise, represented the experience of Generation X. Friends was decidedly un-Baby Boomer-like in how it portrayed its main characters and the world around them. The characters on Friends were not from the dominant generation; there was an undercurrent all along the way that despite personal and professional success, they still lived under the thumb of “The Man” (the Boomer Man). Friends brought the culture of a disaffected Generation X to the fore. Many of the Gen-Xers I know strongly identified with all things Friends. Yet, Friends was also important for Millennials. Particularly for older Millennials, Friends was a glimpse into the life we were about to live (not really, but it sure seemed like it). I was in 6th Grade when Friends airing started in 1994. I was in my 3rd year of university degree when Friends faded to black for the last time. For Generation Xers, the cast of Friends was living life along side them. For Millennials, Ross and Rachel, Chandler and Monica, Joey and Phoebe, were like older siblings, or cool older cousins, the hip kids at the back of the bus. They were the people we wanted be when we grew up. They showed us what young adulthood looked like as we lived our teenage years and first years of adulthood. Re-watching Friends this time around was a completely different experience. Sure, I knew what was going to happen, but I now know so much better what it is like to fall in love, get married, become a parent, look for work, get an education, straddle that time between adolescence and adulthood. I could see myself in the characters, rather than seeing that older sibling. But as we made our way through the series, I started noticing something more about Friends, something about community and group dynamics, something about relationships and being part of a group. And, I think there is something to learn from Friends. Something that pastors, church leaders and people in the pews would do well to pay attention to. What made Friends so special was that it was about deeply flawed people. The characters had deep personal flaws and their lives were greatly affected because of them. Sure plot elements were contrived and needed to fit within the elements of a sit-com, but every episode didn’t resolve neatly and nicely at the end. Relationships were affected in the long term. Life decisions had long term effects on the show. Characters started relationships and broke up, got married and then divorced. They lost jobs and started over. They had issues with addiction, mental health, infertility, sexism, racism, education. They had children and complicated relationships with family. They had all kinds of issues to confront – a lot like people in real life do. 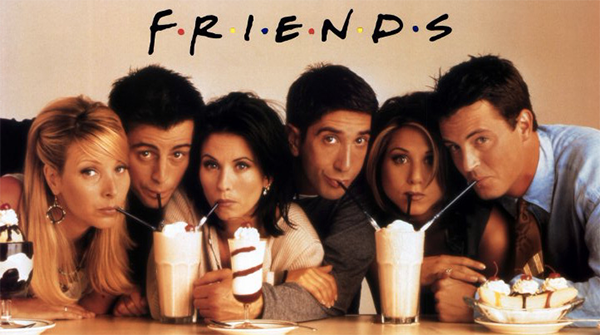 The six characters on Friends are not that different from people in churches – people who come with all manner of complex life issues, people who are deeply flawed, people struggling with relationships, work and family. And again, like a lot of church people these problems always hovered below the surface. Sometimes conversations about the weather, sports, what to eat for dinner, music, or pop-culture easily slipped into issues rising up and taking over. Old fights were always just one wrong comment from being dredged up again. And still like church people, the characters of Friends struggled along the way. They didn’t always handle each other and their issues well. They weren’t perfect and couldn’t keep their problems from affecting their relationships and their happiness. Things didn’t always work out (as much as a sit-com could allow for that). Watching all 10 seasons of Friends again, really hit my millennial sensibilities. All that time spent doing team-work and learning how to relate to others as a kid, all the time that I spend thinking about congregational systems and group behaviour, all of my interest in how we interact as people in relationship was piqued by Friends this time around. The thing that hit me was how those six Friends stayed committed to each other despite each other’s flaws, despite the problems and issues, despite the conflict and hurts and pains. It is where Friends diverges from recent hits like Mad Men, Breaking Bad or The Big Bang Theory (where characters seem especially close to blinking on commitment). Their flaws didn’t consume them. Their commitment to each other was never in question. And this is where Friends so often diverges from the Church. At least in my experience, church people won’t commit to the flaws in other people. We commit to the good stuff, the easy stuff. But when the painful stuff rises to the surface we don’t stick around. Well, at least we find it hard to stay present. I think we could use a little more Church according to Friends. And I struggle as a Millennial – who was brow-beaten in school with how to manage group relationships – when church people (especially Boomers) are quick to abandon that commitment to each other when our flaws start to show, and especially when our flaws affect our relationships. I imagine I am not the only Millennial who struggles with this. And at the risk of making broad generalizations, I think there truly is a difference between Boomers and Millennials. I think Boomers were raised by a generation who suffered collective PTSD after World War 2. I think Boomers were taught to keep the flaws under the rug, to send the problems away when they come to the surface and to, above all, pretend like everything is okay. They were taught this because this is how their parents, the G.I. Generation survived The Great Depression and World War 2. But when our group dynamic and congregational systems are focused around pretending that the problems don’t exist, that our flaws are hidden, that conflict should be avoided at all costs, it is really off-putting for Millennials who were taught to work things out. We were taught to let the problems come to the surface, to be laid out on the table. I am a High Church Millennial. I am a Lutheran Pastor. There are a million reasons that I stay committed to the Church. And the flaws and failings, the hurts and sufferings of my fellow brothers and sisters in Christ are the last reasons that I would ever consider walking away from the church. But if there was something that would push me away, it is how church systems and behaviours are built to avoid dealing with or even acknowledging those flaws and failings. It is really hard for me when otherwise intelligent, caring, compassionate individuals let unhealthy group dynamics and systems of behaviour rule. It is unbearable when we let… no, when we demand, that the status quo stomp on communities – on us. If Friends can teach the Church anything, it is that we can get past our issues, we can love people despite their deep flaws, and most importantly, we can make the most important group dynamic be a commitment to loving each other. I think Millennials need a church according to Friends, a church willing to commit to people, flaws and all.